What Healthy Foods Aren’t Good For You? As your body reacts differently to each and every food, the food you eat each day will enhance proper body chemistry, or disrupt the correct balance. You’ve probably heard of food allergies. But food sensitivities are very different and affect your body in different ways. When you’re allergic to a food, your body reacts immediately. You feel symptoms like swelling in your throat, sneezing, nausea, or you break out in a rash. An almost certain sign you’re allergic to a food is the speed of which these symptoms develop, usually within minutes after consumption. Food sensitivities are sneakier. If you are sensitive to a food, your body may not react for several hours, and in some cases, not until the next day. The symptoms associated with food sensitivities are deceptive as well because you wouldn’t normally associate them with food (headaches, aching muscles, chronic sinus congestion, and fatigue). There’s even a connection to your mind. There are doctors and scientists that say food sensitivities can cause mood swings, affect mental clarity, and cause irritability. You might not even notice these food reactions. Most of them work at a cellular level, and may cause symptoms that you won't notice right away. Or, you might not EVER make the connection that what you're eating is actually damaging your body. So, nutritious foods you eat (like corn, soy, egg whites, green pepper, whey, or chicken, for example) may actually act like a poison in your body. When you eat foods that form toxins in your system, those foods can cause harmful, chronic problems with your health. Food addictions are often related to food sensitivities. Many food addictions are with foods highest in sugar and fat (sodas, fried foods, chips, deserts, pizza, etc.). Craving these foods (even though you know they aren’t good for you) result in a cycle of compulsive eating. Furthermore, water retention is another symptom of food sensitivities, which only compounds the weight problems of most Americans. 95% of the people we've tested show that one or more foods they regularly eat cause a toxic reaction in their body. Some people are genetically more susceptible to food sensitivities. But clinical research shows there are several lifestyle factors that play a massively influential role in developing food sensitivities. What this means is that you have within your power to create or destroy health in your body. Many people don't realize that the level of toxic exposure incurred on an individual level is extremely high. Toxins inside the home, including the off-gassing of plastics, mold/mildew/fungus contact, and heavy metal exposure are dangerous and can affect us on a physiological level. Toxins in our foods, including preservatives, pesticides, additives and other chemicals can also present serious problems. As a result of these recurrent exposures, the GI tract can become damaged. This damage causes micro-lesions in the lining of the gut which enables small food particles to pass through to the blood stream. On the surface this may not seem to be a problem, but the food particles cause an inflammatory immune response in the body. This leads to a myriad of symptoms and is a contributing factor to the diseases of the 21st century. One growing epidemic is Leaky Gut. When chronic inflammation occurs in your gut, your body is incapable to properly digesting your food. When your body is not efficiently digesting foods you eat, incompletely digested food enters your blood stream. Your immune system reacts adversely, resulting in unpredictable symptoms in different parts of your body. Eating habits is also a major contributing factor in the development of certain food sensitivities. Eating too much of certain foods, eating too fast, not chewing your food thoroughly, eating while emotionally upset, or eating over-processed foods can result in food sensitivities. Some food sensitivities develop very early in life. There is a wide body of research that links breastfeeding to a healthier digestive system. Babies who are fed formula or cow’s milk often develop sensitivities for years. 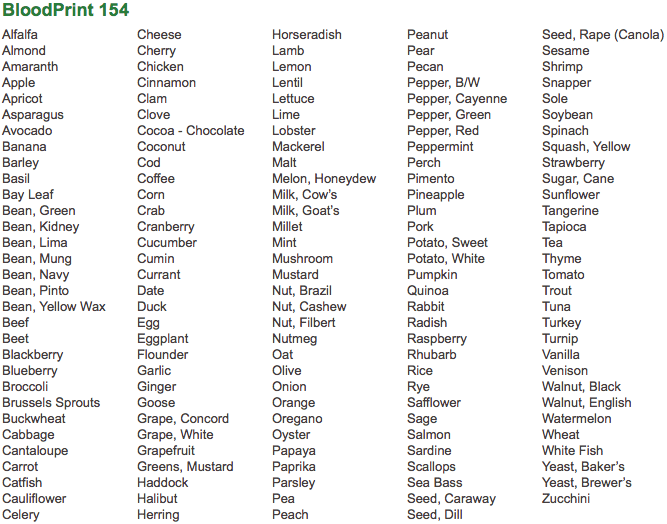 Specifications: Identifies reactions to 154 foods associated with inflammation that are linked to chronic health problems. NOTE: This lab is not currently available in New York. If you live in New York and wish to take this lab it must be shipped to a friend, family member or a hotel you are visiting out of state. The lab must be taken and mailed back out of state as well.